"Chinese Opera is embedded in the landscape of China, just as iron ore is embedded in the Australian landscape", remarks Providence-based artist Daniel Peltz, in explaining how it came to be that he proposed to re-enact the displacement of minerals occurring in mining super-town Tom Price by producing a traditional Chinese opera there. As part of the WA-based SPACED: Future Recall residency program, Peltz will spend 8 weeks in Tom Price over one year, working with its community groups and liaising with the big fish in that small pond, Rio Tinto Iron Ore. His residency has already begun to lay bare the mechanics of living in a company town, the huge scale of iron ore production, and the astonishing movement of infrastructure it requires. Described another way, the resources industry in Australia is a cycle of value extraction. A worker completes an intensive &apos;swing&apos; at site with the promise of a high value burst of income. Wages in Tom Price are well above average, making it the most affluent regional town in Australia. Next, mining companies dig value right out of the ground, in incredible bulk and at a carefully managed rate of efficiency. Cost-benefit analyses underpin all procedures, including water recycling, flora re-habilitation and employee support services. Lastly, Chinese companies buy the ore and process it into steel. Labour in China is cheap, or we&apos;d make the steel here. Peltz sees these cycles at work in Tom Price, "a town who&apos;s reason for being is to plant charges in its rock faces, dig out its insides, load them on trains and ship them to unseen factories, where they are deemed more valuable." Thomas Moore Price was the Vice President of Kaiser Steel when he first flew over the site of the town that would take his name. Looking below, he declared that if God had provided such richly endowed landscapes, surely they were meant to be dug up and used. "I chose to focus on him," says Peltz, "and to think of my insertion into the history of Tom Price as a sort of re-enactment." Enlisting Rio Tinto, Price oversaw the transformation of Tom Price Mountain into an open-cut chasm, producing millions of bankable tonnes of iron ore to be processed at Kaiser&apos;s $260 million steel mill in Fontana, California. This industrial lore paints a picture of Price as some patriotic, pipe-smoking Upton Sinclair character, turning dust and rock into dollars. Nevertheless, Kaiser was bankrupt by the 1980s and the mill sold to China. 300 workers from the Guangxi Province were flown in to dismantle the plant and reinstall it in Asia, and Tom Price continues to supply its ore. Into this crucible of investment, land and infrastructure steps Daniel Peltz, an artist fascinated by communities whose rhythms are mediated by the marketplace. Being new to a WA country town should presumably be an experience of conspicuity, of being a stranger; but Tom Price is different. There are no dynastic families with long-held pastoral footholds to cast suspicion on outsiders. Residents are mostly fulfilling a 5-year plan at most, before returning home and being replaced by others. Peltz is their peer. "I&apos;m not so different from all the other contract labor in this company town" he considers, "I&apos;ve been sent here to mine, to craft a life from the excess. I&apos;m drawn to the itinerant nature of this town". Neither Peltz nor the short-term workers will buy a house or run for council in Tom Price, starting something they&apos;d later have to abandon or uproot. Peltz is therefore skeptical of labeling Tom Price a "community" (instead cushioning the word in quotation marks). This is not because there is no good feeling among its residents, but because a community is by definition static. "I&apos;ve harmonized with my status as a temporary resident, which is naturalized in this context," he says. Those who witness his presence will move on. The landscape itself is daily blasted and minced and taken elsewhere. That the history of his residency will be fractured and exported in the same way is Peltz&apos;s methodology. Having completed his first four-week stint, Peltz has devised two artistic episodes, to be undertaken on a later swing, just after cyclone season, when it gets stinking hot. The first will be a traditional Chinese opera, telling the story of Tom Price: The Man, The Town, and The Deep Cut of the Pilbara. The script, in Mandarin, includes scenes of workers betting on horses at the local pub, behind Peltz&apos;s backdrop of Mt Nameless, painted in Chinese-style brushwork. The event will be wildly incongruous with its surroundings, yet Peltz&apos; decision to stage the opera was "fairly intuitive". In fact, the artist sees parallels with the mining process at every stage; "The story will change based on the extraction, transport, processing and distribution network; in this case, composers, musicians, singers, sponsors. I&apos;m looking to extract this resource from China, to dig it up and bring it to Tom Price." To work regionally is to sacrifice whatever it is you can only get in a city: proximity to family, friends, cultural variety or a sense of belonging. During his residency, Peltz only saw his young daughter via Skype. There has been lively discussion in the press and academia this year about the effect of FIFO schedules upon mental wellbeing in the resources workforce. Tom Price was assembled almost artificially to furnish the mine with ready labour, but today there is no trace of any clock-on clock-off approach to its employees. In exchange for personal displacement, mining companies not only underwrite salaries, but community centres, gyms, counseling, schools, housing, festivals, insurance and health needs. Peltz describes these employment packages as "attempts to provide the infrastructure necessary to sustain a human life". 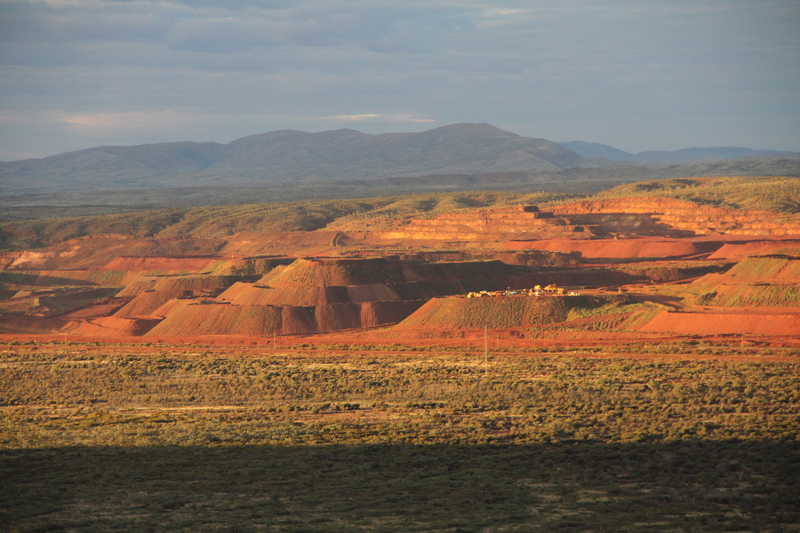 Remoteness is essential to mining. There could never be a Paris or Sydney mine: its minerals could never be more lucrative than its real estate. Peltz&apos;s second proposal, a "simple gesture", depends on the cooperation of Rio Tinto. 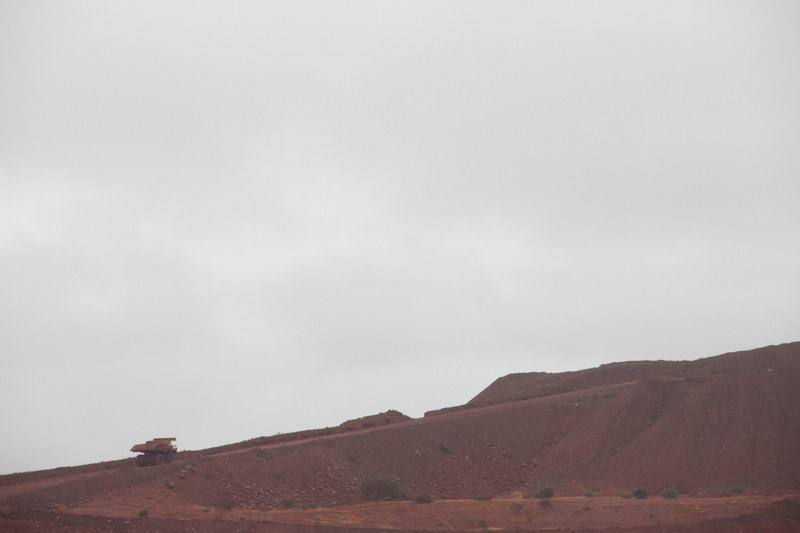 "I&apos;d like to travel with a bit of iron ore", he says, "from Tom Price, to Dampier, to a port and a steel mill." He hopes to gain access to the mine site, extract a single scoop of ore and to carry it to China, where it will resume its intended course. Clasped in Peltz&apos;s hand, it shall convey the length and internationality of the journey of Australian resources. Considering this effort, the gesture seems more outrageous than "simple". It also echoes that other fistful of Australian sand, returned by Gough Whitlam in 1975 to the custodianship of Gurindji leader Vincent Lingiari, signifying the restoration Waddi Creek to its traditional owners. Both are gestures of vast inter-cultural proportion. The SPACED residency model is designed to allow location to inform artmaking. Long engagements are a central strategy in Peltz&apos;s practice, allowing him to outwardly &apos;play&apos; the researcher. In exploring Tom Price, Peltz takes on the air of an HG Wells character: an enquiring socio-naturalist, muttering "how curious" and scribbling notes during his poetic evening strolls. But what does the town believe a resident artist does? "There is significant ambiguity about it," Peltz explains. "I am curious about the expectations people have of my role and the role of art in their lives. Things are asked of me, design or documentation work. I enjoy engaging in those processes. They develop my relationship to the place and provide social access. It is interesting to be in a position to give freely of your labor in a place where so many people come to have theirs valued." Prompted by this overwhelming focus on efficiency, Peltz has endowed the role of resident artist with functionality. "I see the work as something that exists for the current population of the town and lives on as a narrative of something that happened here," he notes. "I&apos;m not looking to write "the" history of Tom Price. I&apos;m living a life and writing a story." We mustn&apos;t think of his residency as being for Tom Price, or about it, but simply of it.